Some natural disasters are sadder than others. I don't mean to belittle the effects of any unfortunate instance when nature unleashes her fury on man, but I can't think of anything more devastating than a kornado. Kernels are whirling at high speed, pelting each other and innocent objects like the ammo from millions of BB guns. On hot days, they can get up enough friction to fling popcorn everywhere. The next day, you'll be overwhelmed by enough hungry birds to remake one of the scarier Hitchcock movies. OK, some products beckon to me by name alone and this is one of them. I have a "special" relationship with corn, or at least the idea of corn. I think it is the king of grains, or at least the evil overlord of them depending on your perspective. I like the flavor of corn in various foods, but I'm not a fan of corn itself unless it is pureed in a nice potage. It's something about the texture. It just grosses me out. 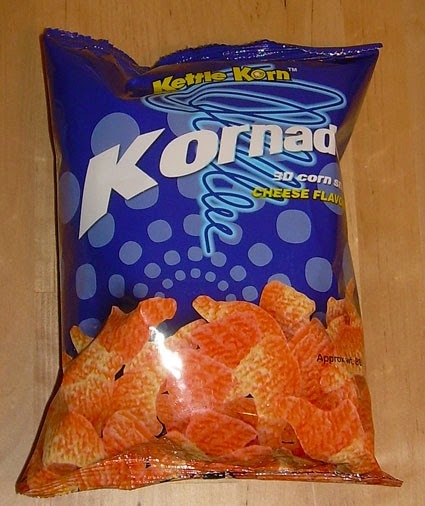 Fortunately, the "kornado" has not only removed those pesky fibrous kernels, but rolled them into little semi-cones. This is called a 3-D snack because these are supposed to resemble tornados, but they look pretty flat. Fortunately, they taste better than they look. The "risk" with salty snacks like these is that they won't have enough cheese flavor, but the flavor powder is very reminiscent of "Cheetos". It's salty and cheesy in that fake way we all know and love and has a very nice, light crunch. No one is more surprised than me that such a cheesy concept (truly, no pun intended) works. Perhaps they can try other natural disaster-themed snacks? Rye-phoons... Corn-canos... Wheat-storms... OK, none of those works as well as a kornado, but that comes as no surprise. Nice product name. 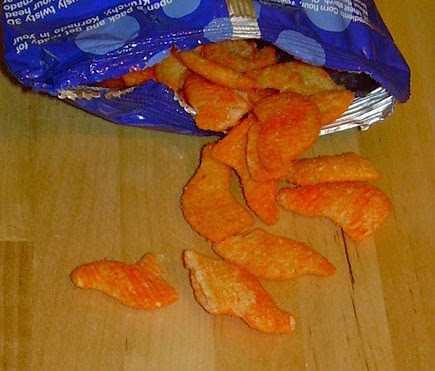 They are slightly reminiscent of Bugles, from the photo.